The Dell USB 3.0 TripleDisplay Docking Station instantly transforms your laptop into a desktop PC with up to 3 monitors. This will not only help boost your productivity, but also allows you to charge your devices, access your external peripherals, find the perfect viewing angle, and much more. High-speed connectivity, with support for Ultra HD 4K displays. High-speed connectivity, with support for Ultra HD 4K displays. Unlocks enhanced productivity and entertainment options. Quick, easy set-up. Simply connect your devices into the docking station, and you are ready to start. A great choice for corporate environments that use a Wake-On-LAN and PXE boot (on selected platforms). Ports Included: 3 USB 3.0, 2 USB 2.0, 2 HDMI, 1 DisplayPort, 1 Gigabit Ethernet port, 1 audio out. What's In The Box: Dell Docking Station, 2' USB 3.0 Cable, AC Power Adapter, HDMI-DVI Adapter, Installation Driver CD, Documentation. The Dell Docking Station - USB 3.0 connects your laptop to up to three additional monitors, various external devices and the Internet with a single cable. It features a convenient way to expand the capabilities of your portable PC and customize your desktop computing environment. This sleek, compact dock unlocks enhanced productivity and entertainment options with highspeed connectivity and support for Ultra HD 4K displays. It also includes three USB 3.0 ports, as well as two USB 2.0 connections, ensuring compatibility with a vast array of peripherals, such as external hard drives, printers and scanners. Moreover, it is a great choice for corporate environments with Wake-On-LAN and PXE boot (on selected platforms). 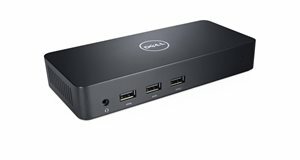 The Dell Docking Station - USB 3.0 connects your laptop to multiple additional monitors, various external devices and the Internet with a single cable. It's a convenient way to expand the capabilities of your portable PC and customize your desktop computing environment. This sleek, compact dock unlocks enhanced productivity and entertainment options with high-speed connectivity and support for Ultra HD 4K displays. Designed for Ultra HD 4K resolution, this USB 3.0 universal docking station enables compatible PC's to display 4K resolution when connected. Expand your desktop by connecting several displays at once, including one Ultra HD 4K display and two Full HD displays. The Dell Docking Station allows you to spread out your desktop on up to three external displays, increasing productivity and making it easier to manage multiple applications.